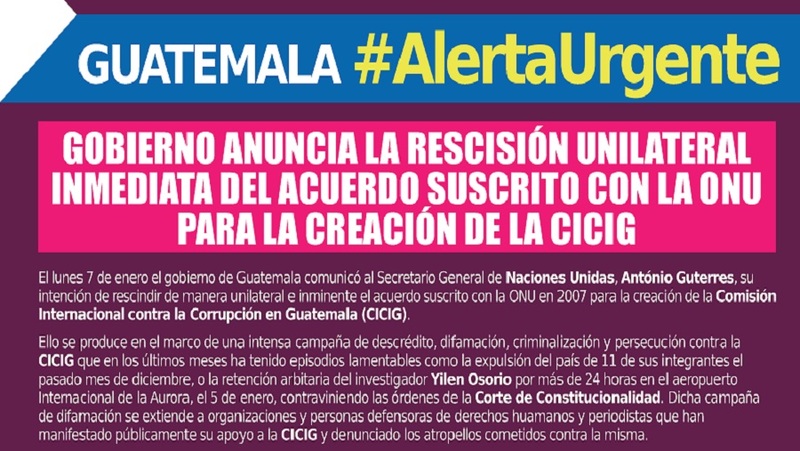 On Monday, January 7th, the Guatemalan government communicated to the Secretary General of the United Nations, Antonio Guterres, its intention to unilaterally and imminently rescind the agreement signed with the UN in 2007 for the creation of the International Commission against Impunity in Guatemala (CICIG). This took place in a context of an intense campaign of disparagement, defamation, criminalization and persecution against the CICIG in recent months, including regrettable episodes such as the expulsion of eleven of its members last December and the arbitrary detention of investigator Yilen Osorio for more than 24 hours in the Aurora International Airport on January 5th, in contravention of the orders of the Constitutional Court. The smear campaign has been extended to organizational and individual human rights defenders and journalists who have publicly stated their support for the CICIG and denounced the abuses committed against it. In the framework of the Peace Accords, the CICIG has done crucial work in strengthening justice and the state of law, and has also opposed impunity and corruption by dismantling criminal networks and by conducting investigations that have shown the presumed involvement in these networks of high officials of the three branches of government. Moreover, the work of the CICIG is a cornerstone in the defense and protection of the rights of women and the eradication of violence against them. For these reasons, the revocation of its mandate leaves the Guatemalan people defenseless and heightens the vulnerability of human rights defenders in the country. 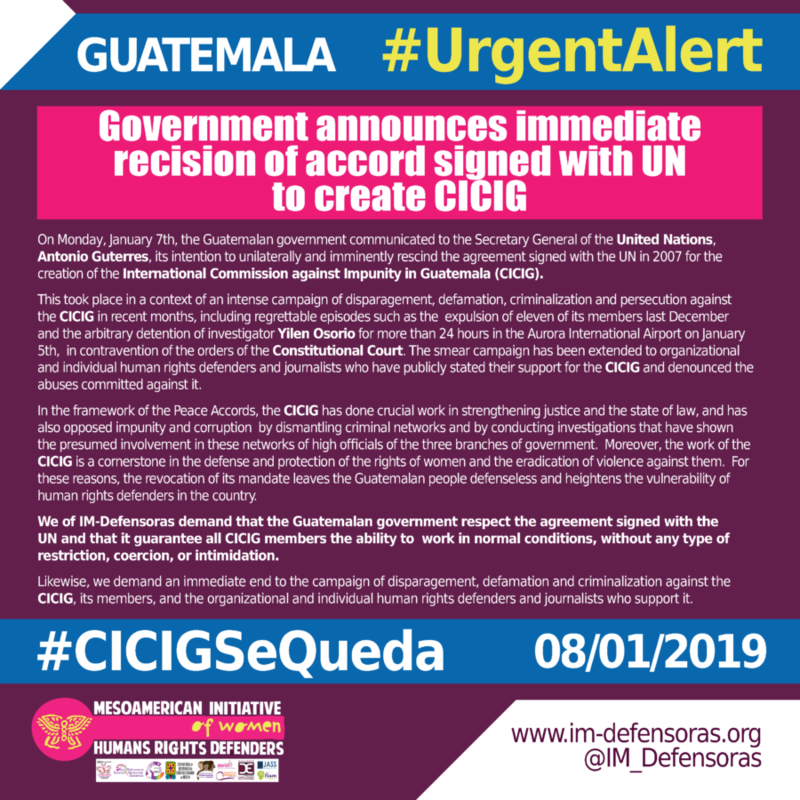 We of IM-Defensoras demand that the Guatemalan government respect the agreement signed with the UN and that it guarantee all CICIG members the ability to work in normal conditions, without any type of restriction, coercion, or intimidation. Likewise, we demand an immediate end to the campaign of disparagement, defamation and criminalization against the CICIG, its members, and the organizational and individual human rights defenders and journalists who support it.